A couple of weeks ago, in my post on quotes, I shared that my mother kept of notebook of quotes, poems, and notes. 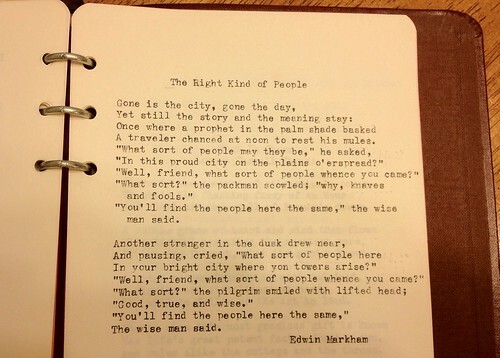 One of those poems was "The Right Kind of People" by Edwin Markham. This poem is an eloquent reminder that we find what we seek. If our expectation or outlook is negative, that result will follow. If we expect to find the positive in a situation or in others, that's what we will find. If my wife, daughter, and I go for a walk, it feels like torture for my daughter and she lags behind us as though some invisible force is pulling her backwards. However, if she has friends with her, she bounds and skips like a doe dancing in the meadow. I've told her many times that the choice to walk behind or run ahead is mental - you make the choice every day. Not too long ago I had the opportunity to attend a conference as a Disney resort. Each morning, as attendees entered the conference area, we were greeted by a gentleman wearing over-sized Mickey Mouse gloves. This man was happy and welcomed everyone with a friendly greeting. I told him, "I appreciate you being so welcoming and cheerful in the mornings." His reply? "You have a choice each morning to be happy. I choose to be happy."